How do I use Loceryl? Loceryl is a colourless, medical nail polish with the active substance amorolfine: a fungicide. Loceryl belongs to the so-called broad spectrum antimycotics: the drug is effective against various fungi and yeast types. 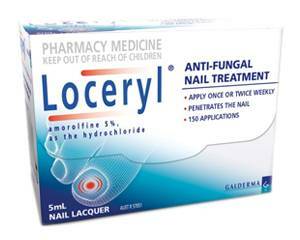 Loceryl is used for fungal infections of the nail(s). A fungal nail, or 'chalk nail' is a white or yellow discoloured nail with thickening and/or crumbling structure. The skin around the nail can be red and/or itchy. A nail fungal infection can both occur on the toes or fingers and is usually (especially toe nails) contracted in a moist environment, for example in a swimming pool or sauna. Before applying the nail polish, file the surface of the contaminated nail(s) with one of the supplied nail files. That removes the old coat of polish and allows the active substance of the new coat of nail polish to penetrate the nail bed well. Rub de filed nail(s) clean with one of the supplied cleaning wipes. Apply the Loceryl nail polish with one of the applicators and leave to dry for at least three minutes. Clean the bottleneck and the applicator with the used cleaning wipe and carefully close the bottle. Repeat these steps every time you apply the Loceryl nail polish. Attention: You cannot use other nail polish or artificial nails on the affected nail(s) during the use of Loceryl. You will find more information about the use of Loceryl in the patients' leaflet. Loceryl nail polish contains 5% amorolfine. The doctor decides how many times you must apply the Loceryl nail polish. In most cases it is recommended to treat the affected nail(s) once or twice a week. You must continue using the nail polish until the fungal infection has disappeared completely and a healthy nail has grown back. For fingernails this takes approximately six months, for toenails approximately twelve months. Loceryl usually has no side effects. Sometimes a kin rash caused by hyper sensitivity can occur. The leaflet will provide more information about possible counter indications, warnings and possible side effects. Consult a doctor about the use of Loceryl during pregnancy or breastfeeding.